Available in several sizes. Click on image to enlarge. 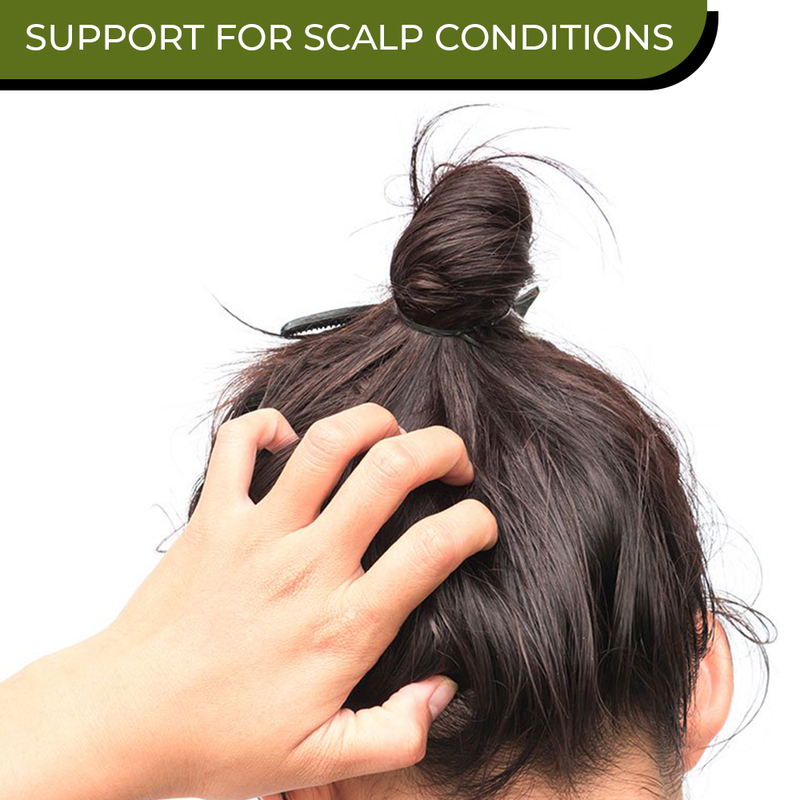 Scalp Rescue Conditioner is the must have treatment for strengthening hair and nourishing the scalp. A firm curly haired favorite. It's sulfate free, gluten free, vegan and color safe too. The formulation supports the treatment of dry, itchy, sensitive, scaly, flaky or dehydrated scalps with its unique proprietary blend of herbs and plant extracts. It has a fresh herb and citrus fresh aroma from the essential oils of Tea Tree, Lemon Tea Tree, Lavender, Rosemary and Geranium. Now you can give your hair some love, and we guarantee it! Before conditioning your hair, use our award winning Scalp Rescue Shampoo and finish with one of our amazing styling products. We also recommend that you avoid using other brands which may contain ingredients, such as silicone derivatives, that reduce the benefits of Scalp Rescue products. Choose the closure that best suits your needs: a standard cap or a water proof pump designed for in-shower use. Love this conditioner, it's super light weight yet it leaves your hair super silky, smooth and shiny. It's also great because it detangles your hair, without even using a hair brush. My hair is very fine so I love how it doesn't weigh my hair down. Seriously, this is amazing. I do not have scalp issues like itch or flake, so I cannot attest to how it works for those issues, but I do wash my fine hair often and my scalp produced a lot of oil. Using this with the shampoo, my hair (which can be dry at the ends) is super soft, has tons of movement, is very shiny, and my scalp is not overproducing oil anymore. It is literally the most expensive stuff I have ever used so I felt like this better work and it DOES. I am very happy that it is natural and not animal tested. Get the samples if you are on the fence about it. I hated the shampoo and conditioner at first. Left my hair very frizzy so I put it up for awhile. I just decided to try these again and I"m so glad I did! My hair now is well moisturized without feeling heavy, looks shiney and healthy! The only problem is my hair soaks up the conditioner so much so that it feels like I didn't apply conditioner so it's hard to tell how much to use. 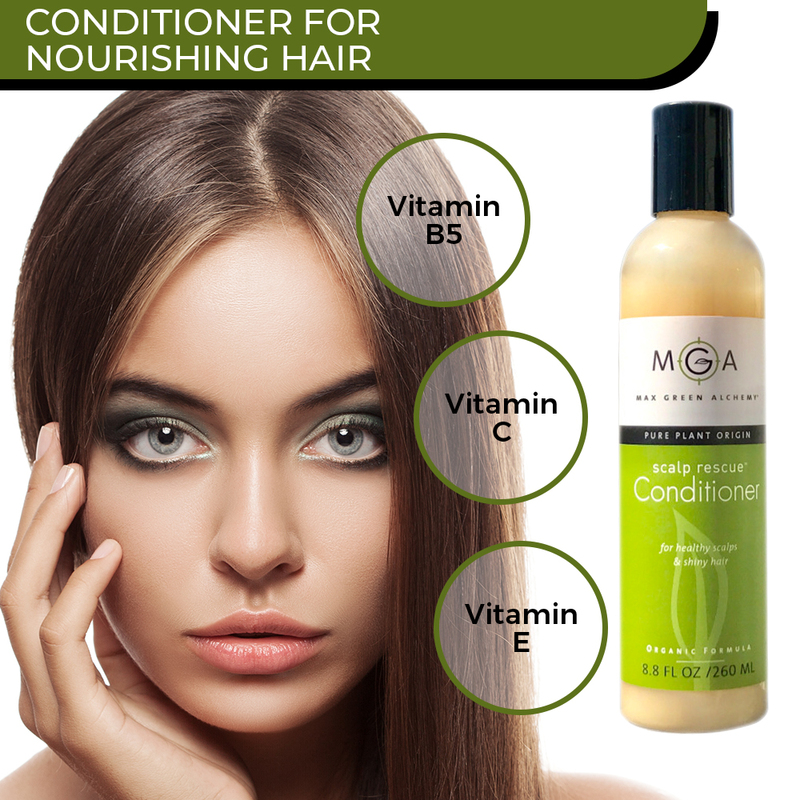 This conditioner is lightweight and rinses out relatively easily. It's a bit light for coarse Asian hair but it helps soften and detangle my hair. Most importantly it doesn't seem to clog my scalp like some heavier conditioners do. I have been using this conditioner, along with the shampoo, exclusively for years - I love how smooth and silky this conditioner makes my hair feel. My hair is now past my waist and is healthy and full - this conditioner makes it easy to comb through without tangles. I highly recommend this product! I have found this conditioner to be an excellent one. 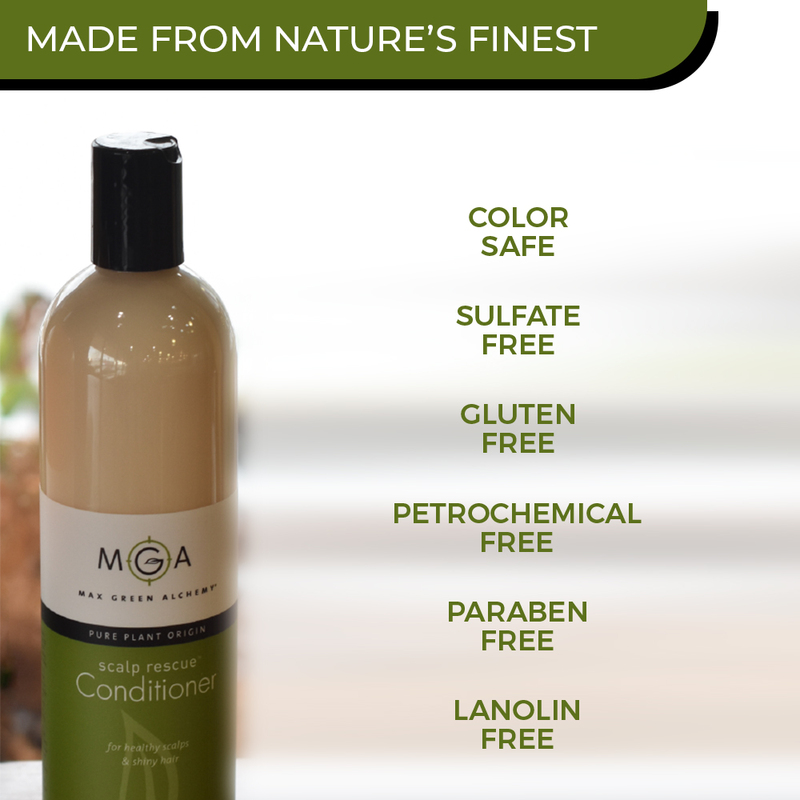 It doesn't weigh the hair down, which is a good thing since my hair is fine.The smell isn't overpowering and the fact that it has some really great ingredients make this conditioner a recommended buy for those looking for a quality and more natural hair-care regimen. I really love this conditioner! After using the scalp rescue shampoo, I always use this conditioner and my hair looks great! It's shiny but not greasy. It rinses out nicely and does not leave a yucky weighed down feeling. I hope you always make this conditioner and the shampoo! I was first introduced to Scalp Rescue by my hair stylist. Before that, about once/twice a year I would experience bouts of dry scalp (the very dry Colorado climate is a challenge). My remedy was to use a dandruff shampoo/conditioner for a couple of weeks, then return to my regular hair products. 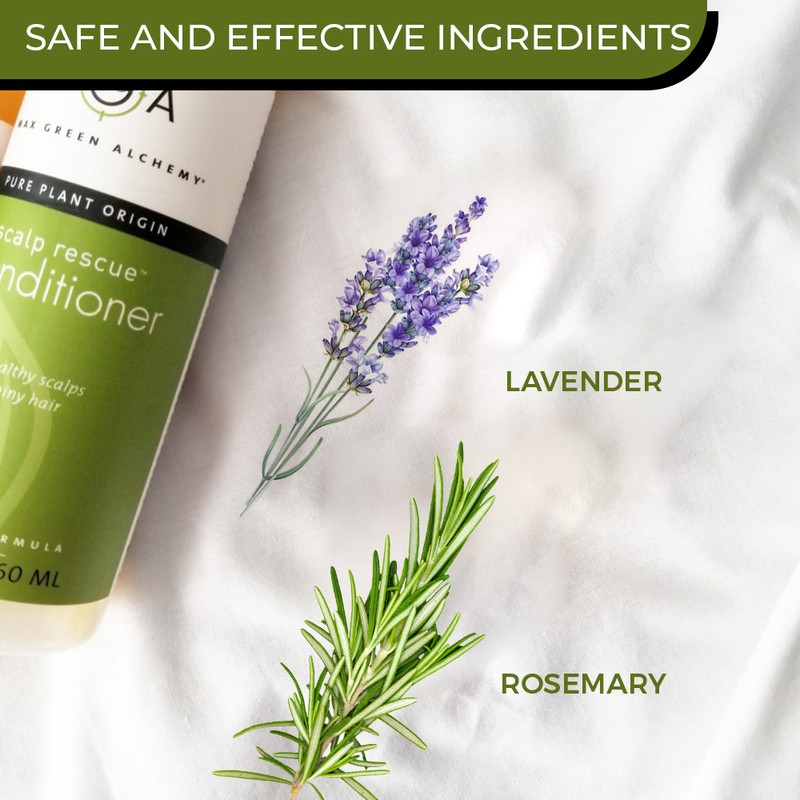 Once I started using Scalp Rescue Shampoo and Conditioner, I never had that dry scalp problem again. I've been using these products for over a decade, and I will continue using. Love the smell!! I use this with the shampoo. I love the shampoo and this conditioner is decent. It is not very thick but still does a good job. I have been using these products for years and feel very strongly that they are among the best products on the market. Both shampoo and conditioner continue to satisfy me as does styling gel. I would recommend to anyone. Q: Ingredients in scalp rescue? A: A complete list of ingredients can be found on the product page when you hit the INGREDIENTS tab. Herbal Infusion [Purified Water (Aqua), Glycyrrhiza Glabra* (licorice) Root, Tussilago Farfara+ (coltsfoot) Leaf, Achillea Millefolium* (yarrow), Salix Alba+ (willow), Tabebuia Impetiginosa+ (pau d'arco), Arctium Lappa* (burdock) Root, Berberis Aquifolium (mahonia), Calendula Officinalis* (calendula), Equisetum Arvense* (horsetail), Urtica Dioica* (nettles)], Cetearyl Alcohol (plant derived emollient), Dimethyl Sulfone (MSM botanical sulphur compound), Glycerine (vegetable source), Simmondsia Chinensis* (jojoba) Seed Oil, Behentrimonium Chloride (plant derived conditioner), Hydrolysed Soy Protein (hair strengthener), Hydroxypropyl Starch Phosphate (plant derived conditioner), Sucrose Cocoate (sugar/coconut emulsifier), Aloe Barbadensis* (aloe vera) Leaf, Butyrospermum Parkii (shea butter), Panthenol (pro vitamin B5), Oenothera Biennis* (evening primrose), Melia Azadirachta (neem), Macadamia* Ternifolia (macadamia) Seed Oil, Melaleuca Alternifolia* (tea tree), Leptospermum Petersonii (lemon tea tree), Lavandula Angustifolia* (lavender), Pelargonium Capitatum* (geranium), Rosemarinus Officinalis* (rosemary), Oryzanol (rice extract), Sodium Benzoate, Sodium Anisate, Ascorbyl Palmitate (vitamin C ester), Mixed Tocopherols (plant derived GMO-free vitamin E).